In 1996, Australian-based company Captain Cook Cruises bought into an existing Fiji day-cruising operation, and Captain Cook Cruises Fiji Islands was born. Joint owners were Captain Cook Cruises' founder, the late Australian Captain Trevor Haworth and Fijian national and current chairman of Fiji Ports Limited, Semi Koroilavesau. The company's first vessel to offer overnight accommodations was Reef Escape, which operated only Yasawa Island cruises. After it was damaged in Cyclone Mick in December 2009, it was replaced with Reef Endeavour, which, coincidentally, was built in the Government Shipyard at Suva in the early 1990s. With the introduction of this larger ship, the company had the opportunity to offer longer and more interesting itineraries. So, it introduced a seven-night Colonial Discovery cruise, a seven-night Four Cultures cruise and an 11-night Lau and Kadavu Discovery cruise. In 2012, the Haworth family sold its Australian cruise operations (which it had started in 1970 with coffee cruises on Sydney Harbour) to SeaLink, a company that runs fast ferries to Kangaroo Island in South Australia. 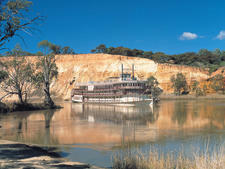 The sale included all Sydney Harbour day cruise vessels and the Murray Princess paddlewheel vessel, which operates three- and four-night cruises on the Murray River in South Australia. The family retained the Fiji operations, known as Captain Cook Cruises Fiji Islands, enacted an extensive refurbishment program and launched a new itinerary for Reef Endeavour. Trevor Haworth died in early 2014. The Haworth family and Koroilavesau continue to be partners, while the company CEO is Haworth's daughter Jackie Haworth-Charlton. Two other Haworth siblings also sit on the board. A trip on any of 130-passenger Reef Endeavour's itineraries is about swimming, snorkeling and meeting Fijians in their village settings. The standout feature of a Captain Cook Cruises Fiji cruise is its connection with Fijian life, whether in the villages and schools or onboard the line's Reef Endeavour, when passengers mix and mingle with the staff and learn about the culture. The crew sings and dances with passengers and offers bowls of kava (a traditional Fijian drink). Friendly and easygoing are the hallmarks of these cruises, along with plenty of opportunities for fun in the sun in stunningly beautiful tropical islands. Food is first rate and plentiful with an emphasis on fresh fruit, vegetables and herbs, and dishes often include unusual Fijian ingredients like rourou (taro leaves) and pineapple and coconut served in interesting ways. Reef Endeavour features five passenger decks; the top Sun Deck contains a small gym, hot tubs and sun lounges, while decks A to D contain cabins, a pool, the Yasawa Lounge reading area and bar and the dining room. All accommodations and public areas have been refurbished with new carpets and furniture since the ship was swamped by Cyclone Evan in December 2012. Captain Cook Cruises Fiji caters to all comers, including children older than 5. Typically, shorter cruises attract families and travelers in their 20s and 30s, while weeklong cruises have an older demographic (50+, with some younger folks, too). About 80 percent of passengers are from Australia and New Zealand; others come from Canada, the United States, Germany, Austria, Switzerland, France and occasionally Holland. 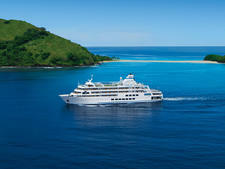 Captain Cook Cruises Fiji has one overnight vessel, Reef Endeavour. Launched in 1996, the 130-passenger ship joined the fleet in 2010.The line's other vessels, the classic tall ship RaMarama and catamaran Fiji One, operate day cruises. Reef Endeavour has several itineraries: * Three-night Mamanuca & Southern Yasawa Islands Cruises visit islands on the west coast of the main island (called the mainland) of Viti Levu. Four-night cruises visit the Northern Yasawa Islands. These islands are volcanic, circled by reefs and have white coral-strewn beaches. Seven-night Yasawa Islands Cruises are a combination of the three- and four-nighters. The northern Yasawa itineraries visit the famed Sawa-i-lau limestone caves and beautiful lagoon -- known the world over as the Blue Lagoon, thanks to the 1980 movie starring Brooke Shields that was filmed on location. Two seven-night itineraries -- the Four Cultures Discovery Cruise and the Colonial Fiji Discovery Cruise -- venture to remote islands and operate only a handful of departures each year. The Four Cultures cruise circumnavigates Fiji's second main island of Vanua Levu, visiting Polynesian, Micronesian, Melanesian and Indian cultures. The Colonial Fiji Cruise sails to Fiji's first capital -- the quaint town of Levuka -- and on to the island of Taveuni, known as the "garden island," through which the 180-degree Meridian passes. These cruises also include plenty of time for swimming, snorkeling and diving. They depart once a month on alternate months; each operates about five times a year. The 11-night Lau Island Group itinerary will visit islands unknown to the outside world in the Lau Group to the east of Fiji's mainland, a region with a fascinating culture and excellent snorkeling/diving opportunities.